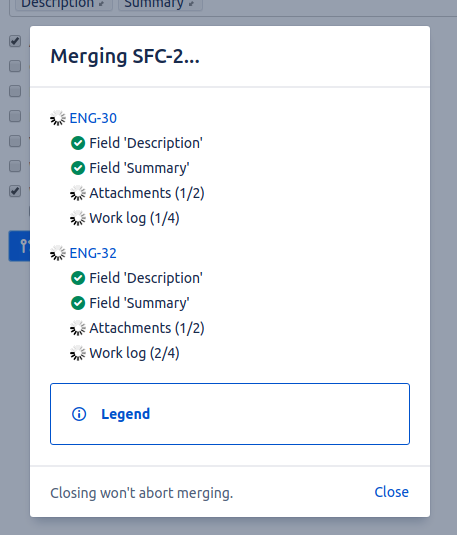 This is the documentation for the Atlassian Jira Add-on Merge Agent for Jira. In the menu on the left side, navigate to “Find new apps” under the “apps” category. Search for “Merge”, wait until the entry “Merge Agent for Jira” is shown and proceed to “Install” the app. After having installed the add-on from the Atlassian Marketplace, you can start using it right away! 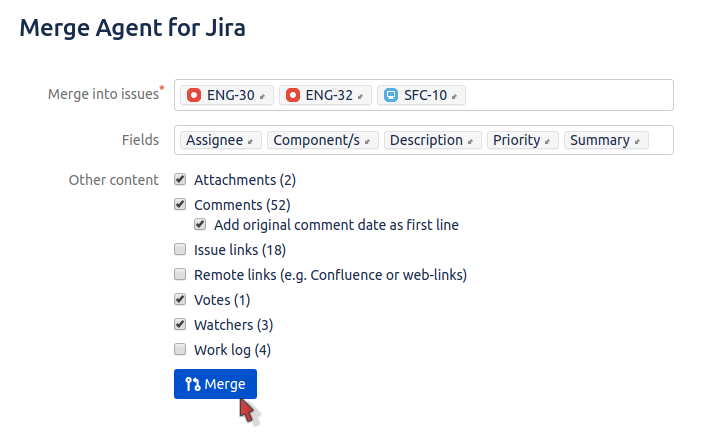 Just navigate to a Jira issue of your choice and click on the “Merge” button on the upper right-hand corner of the issue. You’ll see in parentheses next to these how many of a content type would be merged, e.g. “Attachments (3)” would show that we’ve detected 3 attachments that would be merged if the checkbox is activated. For comments and the work log, you can select that the original time the comment was created at will be added to the comment as the first line (since the comments themselves will be shown as being created when you merge the issue). You may close the dialog at any time without the merging process to be interrupted. Note however that if you start editing the issue right away, your changes may be overwritten until the merging process is finished. Comments and worklogs with restricted visibility will not be merged. Some ServiceDesk and other custom field types can not be merged. If you encounter any further problems or any kind of feedback, feel free to send us an email at support@codefortynine.com. We’ll usually reply within one business day. Thanks for using Merge Agent for Jira!